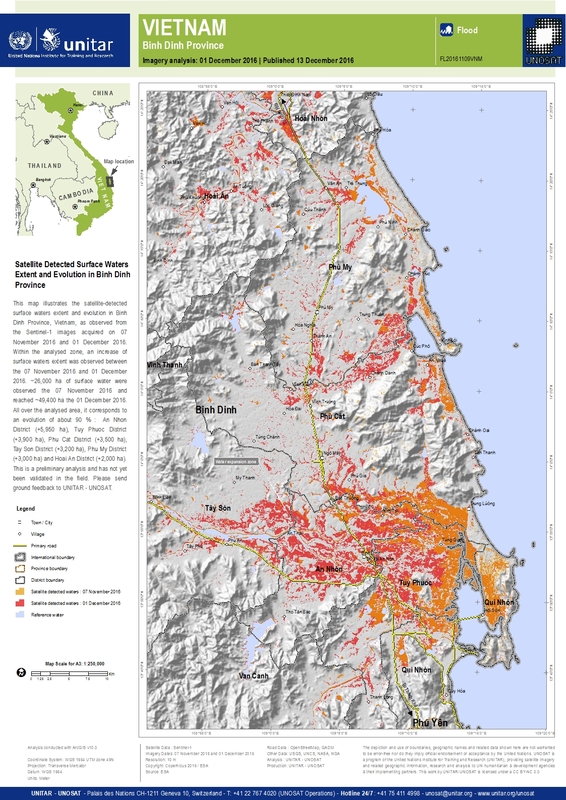 This map illustrates the satellite-detected surface waters extent and evolution in Binh Dinh Province, Vietnam, as observed from the Sentinel-1 images acquired on 07 November 2016 and 01 December 2016. Within the analysed zone, an increase of surface waters extent was observed between the 07 November 2016 and 01 December 2016. ~26,000 ha of surface water were observed the 07 November 2016 and reached ~49,400 ha the 01 December 2016. All over the analysed area, it corresponds to an evolution of about 90 % : An Nhon District (+5,950 ha), Tuy Phuoc District (+3,900 ha), Phu Cat District (+3,500 ha), Tay Son District (+3,200 ha), Phu My District (+3,000 ha) and Hoai An District (+2,000 ha). This is a preliminary analysis and has not yet been validated in the field. Please send ground feedback to UNITAR - UNOSAT.